Vancouver, BC - At a ceremony held on campus today, Langara College became the first college in British Columbia to sign on to the Okanagan Charter. The Charter calls on post-secondary institutions to embed health into all aspects of campus culture for students, staff, and faculty. Over 20 universities and colleges across Canada have signed the Charter to promote action and collaboration, locally and globally. 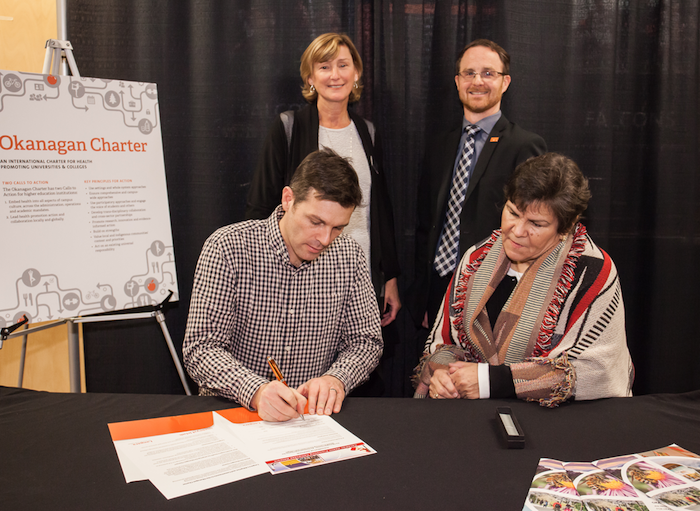 The Charter was signed at Langara’s annual Health & Wellness Fair by Dr. Lane Trotter, Langara College President & CEO; Matt Dolf, Chair, Canadian Health Promoting Campuses Network; and Gail Sparrow, Langara’s Elder-in-Residence from the Musqueam Nation. “It’s exciting to see institutions across Canada such as Langara making mental health and wellbeing a priority for their communities. It reflects the College’s proactive approach in creating a healthy environment for students, staff, and faculty, and its willingness to lead by example,” said Dolf. Signing the Charter is an initiative of Langara’s first Mental Health Framework, a comprehensive outline of Langara’s commitments and objectives to protect and promote the wellbeing of the Langara community. The Framework acknowledges the need to incorporate health promotion values and principles into Langara’s mission, vision, and strategic plan. Langara’s Mental Health Framework Committee was formed in 2016 and includes members from Langara’s Student Services, People Services, and Communications & Marketing, as well as students. The committee developed a three-year action plan that provides the Langara community with resources and support to create and maintain a healthy environment. In addition to signing the Okanagan Charter, other initiatives for 2018/19 include the development of a resource guide, promotion of mental health training, and hiring a dedicated mental health initiatives consultant to implement the Framework. This international Charter was an outcome of the 2015 International Conference on Health Promoting Universities and Colleges held on the University of British Columbia's Okanagan campus in Kelowna, Canada on June 22-25, 2015. The Charter development process engaged researchers, practitioners, administrators, students, and policy makers from 45 countries. The first draft of the Charter was based on input from 225 people through a pre-conference survey and expert interviews as well as a review of existing Charters and Declarations. Standing: Dawn Palmer, Vice President, People Services; Clayton Munro, Dean, Student Services. Seated: Matt Dolf, Chair, Canadian Health Promoting Campuses Network; Gail Sparrow, Musqueam Elder-in-Residence, Langara College.